Cycle advertising is designed in such a manner that they offer the ease to the users. For Cycle advertising, we have made the use of optimum quality materials. Cycle advertising is economically viable. Cycle branding have almost endless potential for advertising, carrying, and delivering business potential to anywhere they can roll. Cycle advertising is usually displayed ads in digital formats. Bike advertising in India creates unique brand presence in target neighborhoods in an eco-friendly manner Bike advertising billboard delivers brand messaging. Friendly, economically viable, and with an almost endless potential for advertising, carrying, and delivering business potential to anywhere they can roll. Tricycle advertising creates unique brand presence in target neighborhoods, in an eco-friendly manner. Bicycle Billboard delivers brand messaging in attractive manner. Tricycle advertising is better option where other means are impossible to go. Tricycle branding gives excellent reach through high-traffic. Tricycle advertising is very good for metro region. 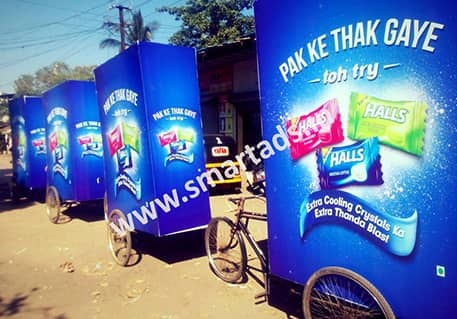 Tricycle advertising is most Eco Friendly mode of advertising. 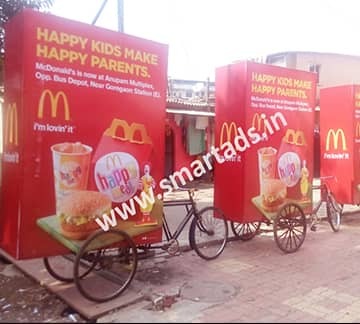 At Smart Ads, we have listed Tricycle branding options for across India. Tricycle rickshaw advertising is termed as low budget and eco-friendly way of promoting your product & services. Tricycle rickshaw advertising gives you the complete advantage of outdoor media in a small budget. Tricycle advertising also helps people to get engaged in self-employment activity. Cycle rickshaw advertising is more cost effective to other traditional media. Tricycle rickshaw advertising is however an outdoor media with non-lit and lit option. Tricycle advertising have the advantage of moving on wheels to your desired place targeting any market segment. Tricycle rickshaw advertising gives you maximum visibility and maximum eyeballs that can be planned in your way.